Newcastle scored twice in four second-half minutes to stun Bristol City but their lead over West Brom at the top of the Championship is down to two points. The Robins, who parted with boss Gary Johnson this week, went a goal up through Lewin Nyatanga early on. A superb Nicky Maynard strike just before the break increased their advantage but keeper Dean Gerken's poor throw allowed Jonas Gutierrez to score. Andy Carroll turned Wayne Routledge's cross home moments later to level. With caretaker boss Keith Millen taking charge of the team, Bristol City began brightly, with Danny Haynes going close twice - first he headed Bradley Orr's cross onto the roof of the net, and then defender Fitz Hall was called into action to block another effort from him. The home side's opening goal came when keeper Steve Harper failed to hold on to a long-range Maynard effort, and Nyatanga followed up to poke home the rebound. Nyatanga was soon in action at the other end of the pitch when his awful slice allowed Leon Best a volleyed chance, but Gerken and Louis Carey managed to smother the shot. The Robins keeper had to have his wits about him again just before the break, as Best set up a chance for Kevin Nolan, but his header was easily gathered. Minutes later Newcastle were made to pay for wasting that chance when Maynard made it 2-0, cutting in from the left and curling the ball into the far corner. Gutierrez pulled Newcastle back into the match when he pounced on to Gerken's poor throw out to Cole Skuse to pull a goal back. And with 15 minutes to go Carroll swept home Routledge's pass to draw the visitors level and seize the initiative. At the death, Gerken made amends for his earlier blunder with a fine fingertip save from Best as Newcastle had to settle for a draw. "I'm not sure I can say I enjoyed the game. I did like walking out in front of a near 20,000 crowd and walking in at half-time with a two-goal lead. "It wasn't about me today, it was about the club and the players. "There were some tired legs at the end because the lads put in everything for the club." "I thought in the end we had the chances to take all three points, but from 2-0 down at half-time you are always happy with a point. "There has never been any question about the spirit in our squad and we had to demonstrate it again." "I knew it would be tough because City had beaten West Bromwich Albion here and were under a new caretaker manager." 90:00+3:33 The match has reached full-time. 90:00+3:05 Jonas Gutierrez takes the chance to get an effort at goal. Louis Carey gets a block in. 90:00+1:19 Jonas Gutierrez takes a shot. Save by Dean Gerken. 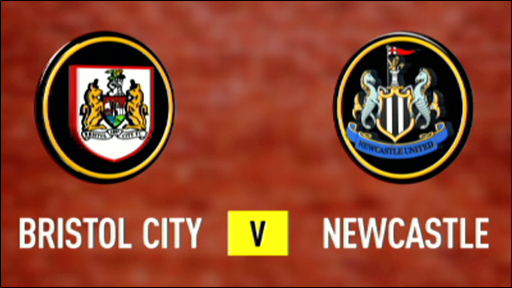 89:29 Free kick awarded for a foul by Nicky Maynard on Jonas Gutierrez. The ball is sent over by Danny Guthrie, Leon Best produces a header from deep inside the six-yard box that clears the crossbar. 88:27 Tamas Kadar gives away a free kick for an unfair challenge on Marvin Elliott. Shot on goal comes in from Paul Hartley from the free kick, Steve Harper makes a save. 86:36 Free kick awarded for an unfair challenge on Jonas Gutierrez by Nicky Maynard. Danny Guthrie has an effort direct from the free kick, comfortable save by Steve Harper. 85:16 The ball is swung over by Danny Guthrie. 84:54 Inswinging corner taken by Danny Guthrie, clearance made by Louis Carey. 84:04 Substitution Danny Haynes leaves the field to be replaced by Ivan Sproule. 82:03 Leon Best takes a shot. Save by Dean Gerken. Corner taken by Danny Guthrie. 81:33 Outswinging corner taken by Danny Guthrie from the right by-line. 80:10 Jonas Gutierrez produces a right-footed shot from just outside the box that misses to the right of the net. 79:06 Leon Best is ruled offside. Louis Carey takes the indirect free kick. 78:07 Leon Best gives away a free kick for an unfair challenge on Louis Carey. Paul Hartley restarts play with the free kick. 74:08 Assist on the goal came from Wayne Routledge. 74:08 GOAL - Andrew Carroll:Bristol City 2 - 2 Newcastle A goal is scored by Andrew Carroll from close in to the top left corner of the goal. Bristol City 2-2 Newcastle. 70:01 GOAL - Jonas Gutierrez:Bristol City 2 - 1 Newcastle Jonas Gutierrez gets on the score sheet with a goal from close range low into the middle of the goal. Bristol City 2-1 Newcastle. 68:59 Andrew Carroll takes a shot. Blocked by Louis Carey. Inswinging corner taken right-footed by Danny Guthrie from the left by-line to the near post, Shot by Jonas Gutierrez. Save by Dean Gerken. 66:39 Unfair challenge on Louis Carey by Andrew Carroll results in a free kick. Dean Gerken takes the direct free kick. 66:04 Danny Haynes is ruled offside. Steve Harper takes the free kick. 64:39 The ball is sent over by Leon Best, Dean Gerken makes a save. 64:05 The referee blows for offside. Steve Harper takes the indirect free kick. 62:39 Foul by Evander Sno on Jonas Gutierrez, free kick awarded. Free kick taken by Danny Guthrie. 60:22 Danny Guthrie sends in a cross, clearance made by Louis Carey. Outswinging corner taken right-footed by Danny Guthrie from the right by-line to the near post, Evander Sno makes a clearance. Effort on goal by Wayne Routledge from just inside the penalty area goes harmlessly over the target. 58:22 Dean Gerken restarts play with the free kick. 58:22 Booking Danny Guthrie is shown a yellow card for unsporting behaviour. 58:06 Danny Guthrie concedes a free kick for a foul on Nicky Maynard. 56:19 Jonas Gutierrez fouled by Evander Sno, the ref awards a free kick. Danny Guthrie crosses the ball from the free kick right-footed from right wing, Marvin Elliott makes a clearance. Corner taken by Danny Guthrie from the left by-line played to the near post, clearance made by Evander Sno. Outswinging corner taken right-footed by Danny Guthrie, clearance made by Lewin Nyatanga. Danny Simpson sends in a cross. 55:29 Tamas Kadar has an effort at goal. Save by Dean Gerken. 50:51 Substitution Tamas Kadar joins the action as a substitute, replacing Fitz Hall. 47:58 Evander Sno has an effort at goal from 20 yards. Save by Steve Harper. 45:19 Paul Hartley delivers the ball from the free kick right-footed from right wing, Wayne Routledge gets a block in. 45:19 Booking Fabricio Coloccini is cautioned. 45:14 Fabricio Coloccini gives away a free kick for an unfair challenge on Nicky Maynard. 45:01 Substitution Jamie McAllister goes off and Evander Sno comes on. 45:00+2:24 The first half comes to an end. Correction - 45:00+1:57 Danny Guthrie takes a shot. Blocked by Paul Hartley. 45:00+1:57 Effort from 12 yards by Danny Guthrie. Paul Hartley gets a block in. 45:00+0:25 Drilled right-footed shot by Marvin Elliott. Blocked by Fabricio Coloccini. 44:55 Free kick awarded for an unfair challenge on Nicky Maynard by Fabricio Coloccini. Paul Hartley takes the direct free kick. 43:05 GOAL - Nicky Maynard:Bristol City 2 - 0 Newcastle Nicky Maynard scores a brilliant goal from the edge of the area to the top right corner of the goal. Bristol City 2-0 Newcastle. 42:13 Shot by Bradley Orr went wide left of the goal. 40:45 Unfair challenge on Jonas Gutierrez by Bradley Orr results in a free kick. Free kick crossed right-footed by Danny Guthrie from left channel. Kevin Nolan takes a shot. Dean Gerken makes a save. 37:07 Bradley Orr sends in a cross, save by Steve Harper. 36:09 Danny Guthrie has an effort at goal from outside the box which goes wide left of the target. 34:43 Nicky Maynard is flagged offside by the assistant referee. Free kick taken by Steve Harper. 31:02 Free kick awarded for a foul by Marvin Elliott on Sanchez Jose Enrique. Free kick crossed right-footed by Danny Guthrie, Paul Hartley manages to make a clearance. 30:36 Unfair challenge on Kevin Nolan by Marvin Elliott results in a free kick. Fabricio Coloccini takes the free kick. 29:23 Leon Best takes a weak shot. Save made by Dean Gerken. 28:40 Danny Guthrie fouled by Cole Skuse, the ref awards a free kick. Direct free kick taken by Fabricio Coloccini. 27:46 Fabricio Coloccini fouled by Nicky Maynard, the ref awards a free kick. Steve Harper takes the free kick. 26:07 Cole Skuse fouled by Danny Guthrie, the ref awards a free kick. Louis Carey takes the direct free kick. 25:54 Free kick awarded for a foul by Andrew Carroll on Christian Ribeiro. Free kick taken by Louis Carey. 24:32 Effort from the edge of the area by Kevin Nolan goes wide of the left-hand post. 22:26 Danny Haynes fouled by Danny Simpson, the ref awards a free kick. Paul Hartley delivers the ball, Louis Carey takes a shot. 20:43 Unfair challenge on Jonas Gutierrez by Marvin Elliott results in a free kick. Direct free kick taken by Sanchez Jose Enrique. 17:40 Jonas Gutierrez crosses the ball, Andrew Carroll has a headed effort from close range and clears the bar. 16:51 Danny Simpson fouled by Nicky Maynard, the ref awards a free kick. Free kick crossed right-footed by Danny Guthrie, clearance by Louis Carey. Danny Guthrie decides to take a short corner. 15:43 Fitz Hall takes the free kick. 15:43 Booking Jamie McAllister booked. 15:38 Jamie McAllister challenges Wayne Routledge unfairly and gives away a free kick. 13:50 The ball is crossed by Bradley Orr, Effort on goal by Jamie McAllister from just inside the area clears the bar. 11:33 Leon Best takes a shot. Louis Carey gets a block in. 9:26 Nicky Maynard provided the assist for the goal. 9:26 GOAL - Lewin Nyatanga:Bristol City 1 - 0 Newcastle Goal scored by Lewin Nyatanga from close in to the bottom left corner of the goal. Bristol City 1-0 Newcastle. 7:35 Free kick awarded for a foul by Fabricio Coloccini on Danny Haynes. Paul Hartley crosses the ball in from the free kick, clearance by Andrew Carroll. Wayne Routledge concedes a free kick for a foul on Cole Skuse. Paul Hartley takes the free kick. Shot by Nicky Maynard. Save by Steve Harper. 5:16 The assistant referee flags for offside against Leon Best. Dean Gerken takes the indirect free kick. 4:40 Foul by Christian Ribeiro on Jonas Gutierrez, free kick awarded. Free kick taken by Danny Simpson. 3:50 Danny Haynes takes a shot. Blocked by Fitz Hall. Corner taken left-footed by Jamie McAllister, clearance by Andrew Carroll. 2:35 The referee gives a free kick against Leon Best for handball. Dean Gerken takes the free kick. 2:04 A cross is delivered by Bradley Orr, Header on goal by Danny Haynes from just inside the area goes over the target.